Why this resource is needed: Children and young people across the country are often left out of decisions and processes that impact their lives. This is particularly true for individuals with learning disabilities and even more so for children with severe learning disabilities or profound and multiple learning disabilities. 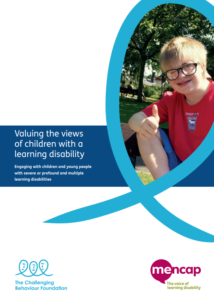 It is very unusual for children with severe learning disabilities to be asked to directly contribute their experiences to discussions about their wellbeing. This resources is from Mencap and The Challenging Behaviour Foundation.